Since 1895, BBC’s summer “Proms” concerts have become a mainstay in the broadcaster’s annual program, occurring every July-September for a two-month series. Held annually in the Royal Albert Hall since the 1990s, the series typically features a palette of seasonally-appropriate classical music, but this year organizers proved their adventurous side in inviting BBC’s forward-thinking Radio 1 to headline their own event. 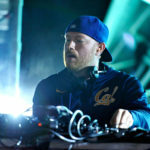 Not much has changed compared to the original considering Prydz’ version also relies heavily on instrumental elements, but it’s fascinating to watch the track’s central piano progression accentuated by sweeping, precise violins and a jazzy drum sample. The added emphasis on strings adds a groovy twist, throwing in a bit more of a disco vibe to the progressive house production. Watch the clip above, and footage of the full show here.